NSK is representative of the absolute juggernaut that is Japanese manufacturing. Always the innovators, NSK makes no attempt at emulation. Joining forces with the American company Brasseler, combines two companies focused on developing new technology, and building on their already superior electric handpiece designs. 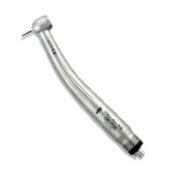 The NSK Z500 series is one of the highest rated electric lab handpieces available offering high performance to lab operations too busy to settle for less. High speed NSK handpieces are becoming mainstream in the US, partly due to the clean head design cannister turbines, and partly to the ultra light materials employed in the shell bodies of NSK handpieces, sparing no cost in materials and specialized injection molds to ensure consistency. 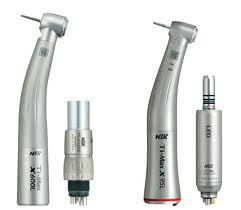 The NSK Ti Max series offers Titanium high speed and low speed handpieces and contra angles. One of the few handpiece manufacturers with their own bearing division, NSK is also becoming a dominant ceramic bearing manufacturer. Totally confident in their place in the industry, NSK also manufacturers bearings compatible with other handpiece brands, which we see as a testament to NSKs dedication to the industry as a whole. Of course, not every one is looking for space age technology. For those who tend to lean toward value side, Pana Air NSK handpieces are an excellent pushbutton highspeed at a very good price, and the NSK EX series offers near perfection on a budget. 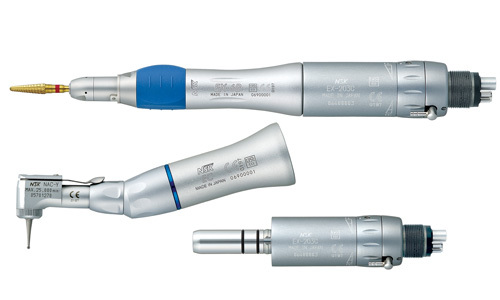 New dentists could easily load up on NSK's value line handpieces without breaking the bank, and upgrade a few years down the road. Nothing but good quality products from this company, and the the marriage with Brasseler can only mean exciting prospects for the future.